Jelly strainer stand with bag is ideal for straining homemade vinegar. jelly, juice and soup. Measures 12"/30.5cm height and 6.5"/16.5cm diameter. Steel legs, with hooked "feet", bend to different size pans and bowls. 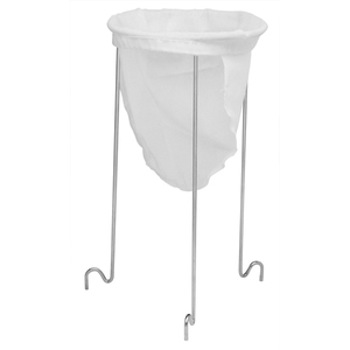 Strainer bag with elastic band that fits snugly around frame opening for sturdy support. Comes with one, 100% cotton bag.